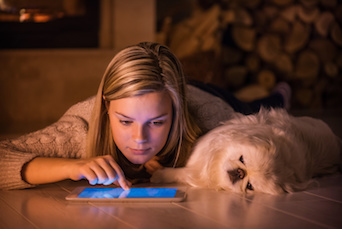 Results from new survey of pet owners predicts that technology, alternative therapies, and specialty diets will be the biggest pet care trends of 2019. You have heard time and time again that pet owners are starting to regard their companion animals less as pets and more as family members. Chances are, you have probably adopted a similar stance in your own home. It should come as no surprise that when looking at the year ahead, some of the biggest trends in pet care are in line with fads that have recently emerged for humans. According to a survey of 1,000 dog and cat owners conducted by the Michelson Found Animals Foundation, a non-profit organization committed to saving pets, 2019 will be the year of smart technology, alternative therapies, and diets that mimic human choices. From fitness watches that track activity to on-demand food delivery services, apps and smart technology dictate the way we live. And now Fido can get in on the fun. According to survey respondents, pet owners are motivated to give pet tech a try—especially if it means it will provide them with a better grasp of their pet's health and wellness. One in 4 pet parents admits they spend more on technology for their pets than for themselves. Of those who currently use health-related pet tech, nutrition apps (47%), veterinary telemedicine (46%), and fitness trackers (31%) top the list of the tools used to maintain the health of their dogs and cats. More than half of the pet owners surveyed are interested in getting a pet tracking device (53%) or a microchip (52%) and 40% are interested in pet monitoring cameras. The foundation found that of pet owners who have tried alternative therapies themselves, 74% have used them on their pets as well. Chief among them is the growing use of cannabinoid (CBD) and hemp-based products. The pet owners surveyed use them as part of a general health plan (45%), to care for an older pet (45%), for a specific behavioral condition (39%), or for temporary relief following surgery or on a flight (39%). In addition, pet parents are becoming more open to alternative therapies and are most likely to treat their pet with aromatherapy (81%), reflexology (79%) or naturopathy (73%). And more than a quarter of pets (26%) have experienced mobility-related therapies like massage, physical therapy, chiropractic, and acupuncture. While pet owners are not going as far as to put their pets on the types of fad diets that litter your own news feeds (i.e. keto, intermittent fasting), they are much more cognizant of the types of foods they feed their furry family members. Of those surveyed, 70% of people who follow a diet for themselves admitted to putting their pet on a special diet too. For instance, almost half of pet parents who eat organic foods feed their pets organic diets (47% compared to a 12% average). Similarly, pet owners on a protein-rich diet, feed their pets protein-rich foods as well (45% compared to a 17% average). “The macro trend of health and wellness and the increasing number of millennial pet parents are changing the way we care for our pets, and it's an exciting time,” Gilbreath said.